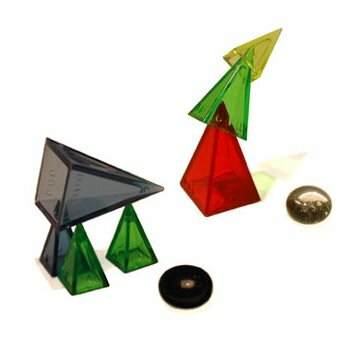 In Zendo, players set up groups of colored pyramids, and one special player - the Zen Master - marks each configuration with a stone to indicate whether or not it has the "Buddha-nature". What is the secret rule that underlies the Master's actions? It's different in each game, and there are an infinite number to try. Players earn guessing stones by correctly predicting the Master's actions and spend them on chances to guess the rule. The first player to reach Enlightenment wins. Powered by Icehouse, Zendo contains 60 plastic pyramids in four colors/three sizes, and 60 stones. Zendo is a game of induction involving Andrew Looney's Icehouse pieces. Inspired in many ways by Robert Abbot's classic game of Eleusis, the goal of the game is to guess the rule created by the "Master". I had the privilege to play my first two games of Zendo with the designer, Kory Heath. The game is thoughtful and very attractive. Players make "koans", which can be any arrangement of the Icehouse pyramids. When a player finishes a koan, the Master indicates whether or not it has the Buddha nature, or in simple terms, whether or not the koan exhibits the characteristic of his rule. For example, the Master may decide a koan has the Buddha nature if at least one pyramid is green (which would be a relatively simple rule). Any koan with a green pyramid, then, will be marked by the Master with a white stone. Black stones indicate the koan does not fit the Master's rule. If the active player chooses, he can call "mondo", in which case players must predict whether or not the koan fits the rule. Correct predictions earn guessing stones, which can be used to attempt to guess the Master's rule. One wins the game only by guessing the rule. An exercise in logic, I found Zendo to be a very enjoyable experience and a change of pace from most games I play. If you need more information before you decide to buy the game, the complete rules of Zendo can be found at the Looney Labs website (www.looneylabs.com). In fact, if you have a complete set of Icehouse pieces and some stones in three colors, you already have everything you need to play Zendo. On the other hand, if Zendo and the other Icehouse games look interesting to you, buy a copy of Zendo. It contains a complete Icehouse set, allowing you to play the vast array of games at their site. Zendo is a great game of deduction that can be enjoyed by just about anyone. I have introduced it to many of my non-gamer friends, and they just kept asking for more! The basic premise is that the "master" makes up a rule unknown to the rest of the players. The players need to figure out the rule by building structures which the master, in turn, deems as either having Buddha nature (the structure follows the rule) or not having Buddha nature (the structure does not follow the rule). The person to correctly guess the rule is the winner. This game is particularly attractive since it contains 4 complete stacks of Icehouse pieces, which can also be used to play many other games! Great job by the Folks at Looney Labs! Zendo is a great game of logic, and if later on you find yourself ready for a new game, there's something like a hundred other games that you can play with the pieces (rules available online). My seven-year-old is happily learning logic with this game, which is SO much more fun for me than playing yet another kiddie game with him, but Zendo is a more subtle (and infuriating) game when played with adults. It's a real shame you can't get this or other Icehouse pieces easily anymore - Zendo is a great deduction game that I highly recommend anyone with an Icehouse set to set up.